How was AMS Euler translated from Hermann Zapf's hand-drawn shapes into METAFONT? Has there been one into METAFONT's pen-strokes approach? What are other examples of existing designs being translated into METAFONT (other than of course Computer Modern from Monotype Modern 8A)? The context: Twice today, in articles across decades, I encountered the idea that METAFONT is better at exploratory creation of new typefaces, than for creating a typeface where one already knows exactly what one wants. While not suitable for implementing existing type designs, METAFONT’s abstract and logical nature […] is ideally suited to developing new type designs where the designer is not sure of the precise look that they are trying to capture and want to experiment with a variety of sweeping changes to their design. Today the outline approach is dominant because it gives instant visual feedback and exacting control; it is direct and visceral. This means designing type at the level of individual letter shapes is intuitive and a typeface emerges quickly. It is especially suited to implementing existing type designs where all the aspects have already been thought out; the TEX community provides a clear example of this in the AMS Euler project , where a team of Stanford students attempted to digitise a new type design for mathematics that Zapf had drawn on paper; the developers tried both approaches and felt tracing outlines was most appropriate. With Donald Knuth’s assistance and encouragement, Hermann Zapf, one of the premier font designers of this century, was commissioned to create designs […]. 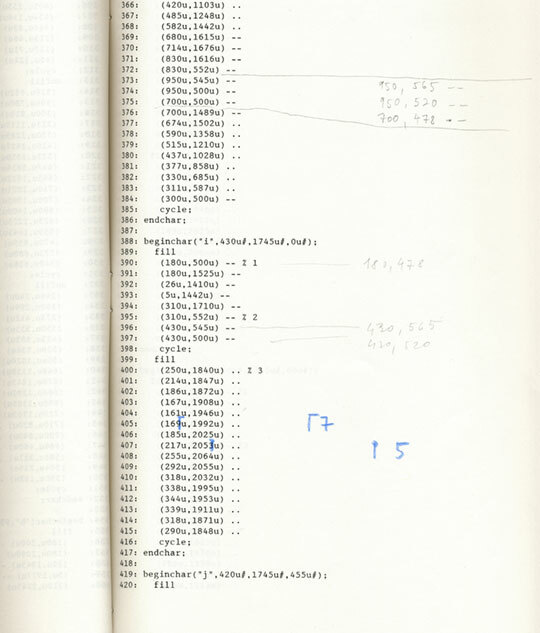 Zapf’s designs were rendered in METAFONT code by graduate students at Stanford, working under Knuth’s direction; the process by which the METAFONT fonts were implemented is described in a report by David Siegel [DRS85]. The glyphs were drawn on paper about 6cm height and these drawings were digitized using pinpoints on paper with a raster. The resulting points were translated to METAFONT and some additional math shapes were added afterwards. Upon approval by the committee, Zapf’s drawings were to be digitised and built into TEX-compatible fonts using METAFONT. 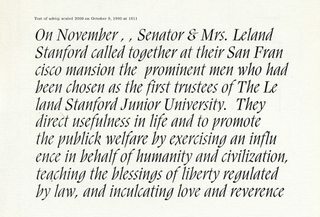 Knuth and a team of Stanford students including David Fuchs, John Hobby, Scott Kim, Dan Mills, Lynn Ruggles, David Siegel, and Carol Twombly spent the next few years trying to develop the Euler drawings into working fonts. The Euler team actually rewrote the METAFONT software itself—as well as a number of software tools to support the production process—as they worked on the fonts, pushing against the limitations of the software and even the computer equipment at their disposal to expand the possibilities of the electronic medium. As Knuth himself points out, the final version of Euler was not really a meta-font. Instead, it is an outlined digitisation built with METAFONT tools. Since the difficulties of producing Euler led to a much more sophisticated version of METAFONT, he expressed a hope that others would use it to solve the problem. So overall, it seems that the computer implementation of AMS Euler used METAFONT technology but did not use the METAFONT approach of pens and erasers. Has there been anything more written about, or addressing, this "failure"? I was expecting that would be the greatest time to... to open this book and, you know, celebrate. I finally had the project done. Well, it was one of the worst days of my life. I opened the book, and I didn't like it at all […] it just looked completely different […] I said, 'My gosh, I'm way far from... from being done with this and getting something, you know, something... something decent'. […]I'm depressed by... by this, knowing that there's still so much to do. […] but my font designer friends... designers said, 'Look Don, the period of apprenticeship for a type designer is always five years, you've only been working on this for two years, how can you expect to have, you know, have succeeded after two years?' So, they were very kind to me and... and through the grants that we had now, I could invite them to Stanford and spend [time with them and] learn from them what I should've done. seven years went by before I was able to generate letterforms that I began to like. And someone should pick up the gauntlet thrown down by Hofstadter, and try to produce a Times Roman, or a Baskerville or some other familiar face from the CM programs. This was in 1988. So are there examples of someone (re)producing an existing typeface in METAFONT, not necessarily by tweaking the 62 parameters of Computer Modern but more generally using METAFONT's approach of programs for pens and erasers with parameters? One example of a font which was translated to Metafont, without being originally designed in it, is an earlier version of Nara, called Adriq at the time. See this detailed article about its history. The creator, Andrej Krátky, started the design in 1988, drawing it by hand in ink on paper. He says the "first stage of drawing was relatively quick". The problem with Metafont was that there was no graphical interface, nor even a way to ‘scan’ an existing drawing into the software. Instead, each letter needed to be entered via the command line as a complex mathematical description before it could be printed or displayed. The process was difficult and "extremely time-consuming", as drawings were overlaid by graph paper and the dimensions were measured at 1/10mm, to "establish the coordinates of the key points for each character". Metafont finally gave me the opportunity to experiment with the slanted (true italic) version of cursive. […] Another important feature of Metafont was its ability to create intermediate weights from two extreme base weights. After several years, the digitized Metafont files were converted into Postscript, and then to Opentype, missing characters were added and there were some design changes, and the font was finally released in 2009 as Nara. Not the answer you're looking for? Browse other questions tagged metafont knuth tex-history typefaces or ask your own question. How to overlay METAFONT proof mode over a PDF or EPS or TIFF? How to distinguish between Metafont and MetaPost?